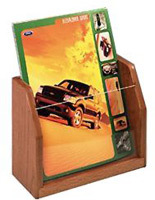 Countertop Mount has Acrylic Sleeve! 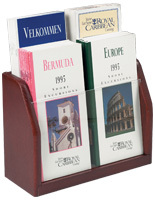 Dual Pockets for Two Stacks of Literature! 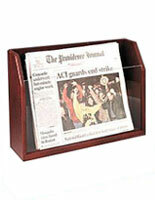 Same-Day Shipping if Ordered Early! 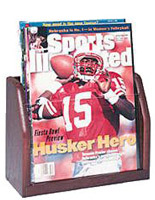 This tabletop magazine holder provides an upscale allure to any office or retail environment. 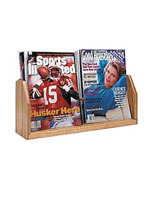 Constructed of solid oak, literature displays like this one are finished in red mahogany. 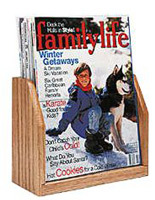 This magazine holder that is an acrylic pocket system holds two vertical stacks of printed material. 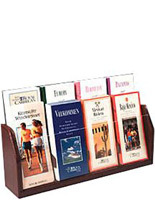 This traditional wooden stand is 18-1/4" wide x 7-1/2" high for standard publications. 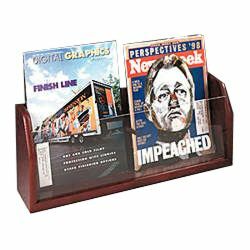 This magazine holder, periodical rack, is a perfect desktop accessory in a professional office!